A statement by Abdul Aziz Ibn Saud as quoted in "Lord of Arabia"
"I am", he continued raising his voice and repeating his favourite phrase, "I am a simple preacher. My mission is to spread the Faith, if possible by persuasion and if not by persuasion then by the sword". With his arguments the Wahabis had no sympathy. For them all good Moslems were Wahabis. The rest were mushrekin, worse than heretics. They, the Wahabis, were the only true Moslems and the only true Arabs. The only sanctions they needed were their own consciences. Near the end of World War II, U.S. Franklin D. Roosevelt traveled to Yalta, in the Soviet Crimea, to negotiate the postwar world order and the creation of the United Nations with Prime Minister Winston Churchill of Britain and the Soviet leader Josef Stalin. Please note: Optical Character Recognition (OCR) is an imperfect art. The book was not perfectly printed. If there are questions - please view a printed copy or the .pdf above. I corrected several "obvious" letter transpositions in the general text - however, place and people names seemed to have been carefully proofed in the original and seem to be at least self consistant. Some spelling may be "British" English, such as "axix" which was used several times. for placing much material in my hands and treating me with unfailing kindness. TO DESCRIBE, so that he may live before the reader, a Moslem and an Arab of outstanding personality, in terms that come within the everyday consciousness of Christians and Europeans has not been easy. The Europeans and the Arabs have much on which they do not agree. They differ in experience, outlook, and manner of expression. Often their standards of right and wrong are not the same. Thus the desert Arabs are aghast at the unpunished adultery and fornication of the Europeans, while the Europeans are shocked at the legal polygamy of the desert Arabs. Polygamy is punished by imprisonment in Europe. Adultery is punished by death by stoning in Arabia. I have, therefore, boldly translated both ideas and phrases, so that the reader shall grasp the correct meaning easily, rather than that his mind should boggle with uncertainty over meticulous details set down in unaccustomed language. Arabic is full of complicated sounds which cannot be produced correctly with Roman characters. It has twenty eight letters which can be made into intricate combinations and which change in shape as they combine. For the spelling of Arabic words I have kept one rule that, while keeping as close to the sound as possible, the written word shall not torment the English reading eye. Thus Saud may be written Saoud, Sa'ud, Sa'oud, Seoud, Se'aoud, Si'oud, Esseoud, and in a dozen more ways. I have kept it as Saud. Again an Arab delights in complicating names. Given any name he will quote a whole genealogical table for it. 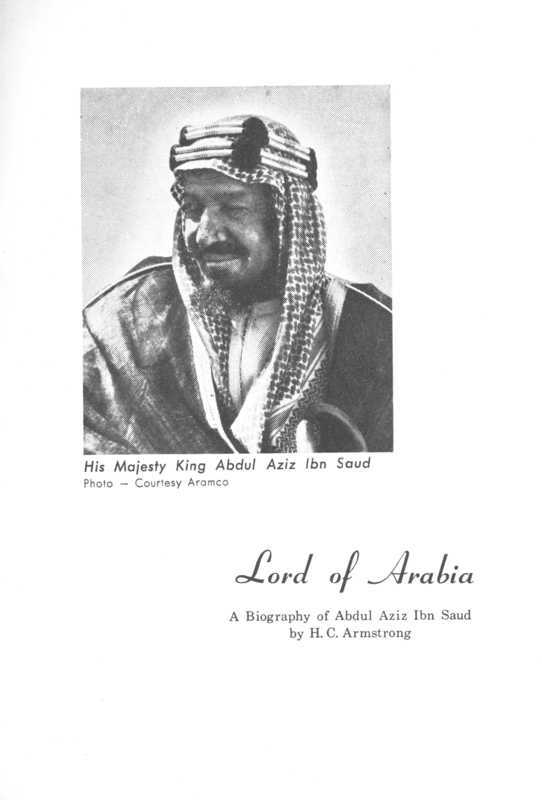 Thus he will describe Ibn Saud as Abdul Aziz ibn (son of) Abdur Rahman al-Feisal al (of the family of) Saud. He will add more generations if he is in the mood. To increase the complications he may call Ibn Saud, Abu Twrki, the Father of Turki, Ibn Saud's firstborn son. In this book I have for each personality chosen one name and retained it throughout. 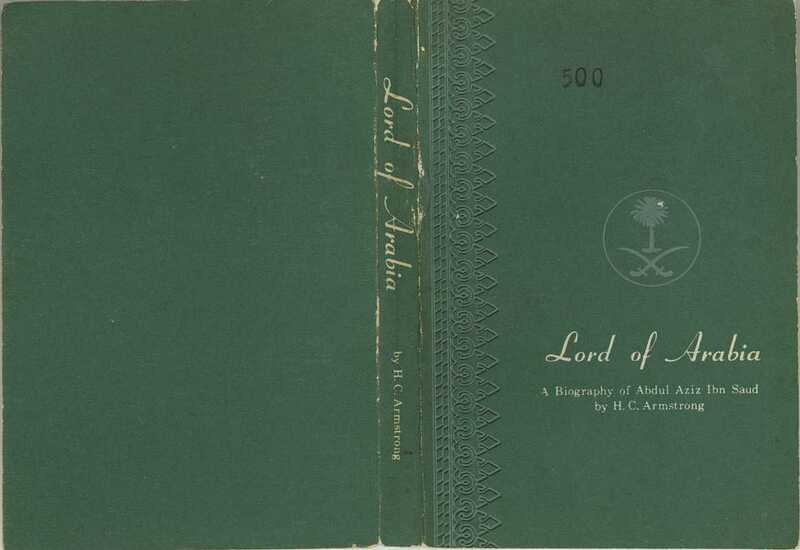 On the life of Ibn Saud there is little documentary evidence, such as books and articles and records. The two principal authorities are Mr. St. John Philby, an English Moslem, who was at one time in the Indian Civil Service, and is now trading in Arabia for English and American firms, and Mr. Ameen Rihani, an Arab Christian from Syria of American nationality. The major portion of the evidence collected has been from word of mouth. The books of Mr. St. John Philby and Mr. Ameen Rihani I have used freely. They are full of valuable material. I have, however, used them only after careful corroboration, whenever possible, with persons present at the events described.